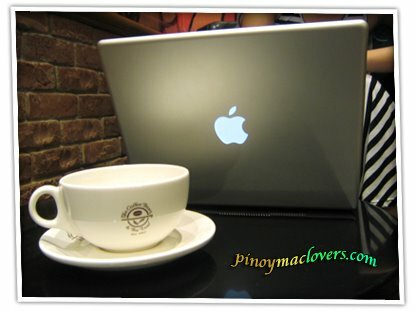 The PinoyMacLovers Me & My Mac Project is very simple. It's a little blog project that features photographs of people with their lovely Macs. See? Very Simple. Our first entry is quite special. We here at PinoyMacLovers were very pleased to find out that local celebrity, Karylle (a multi-talented singer and television & movie actress), is the proud and happy owner of a 12" PowerBook G4. She just loves her Mac so much and graciously agreed to sit down with us for a short Q&A session. PML: So when did you make the switch to Mac? Karylle: I've always wanted to buy a laptop, but I've been too kuripot to buy one so I actually spent my college years cramming in internet cafes, which were later converted into internet gaming spots with kids who cut class and swore constantly. I don't know why I put up with that, but mainly it was because I didn't know what laptop to get. When we started with Encantadia, I wanted to reward myself by finally getting a laptop. It took a while for me to decide, but everyone recommended that I get a Mac. And after I got one, Iza [Calzado] and Alfred [Vargas] also got Macs. Actually we had Macs all lined up in the set, Direk Mark Reyes brings his and so do Jennylyn [Mercado], Diana [Zubiri] and Sunshine [Dizon]. PML: How did you feel when you finally got your Mac and used it for the first time? Karylle: Oh I was so happy! I felt like I made the right choice even if it did cost a lot. PML: What's your favorite iLife program? Karylle: The one I use most is iTunes because of work. But because I love, love, love to take pictures I also use iPhoto all the time. I've actually printed two books already using iPhoto. They make great gifts. But my new favorite has to be iDVD, which I just learned how to use. I made a bunch of DVDs from my summer trip. PML: What are the typical things you do using your Mac? Karylle: I bring it everywhere, everyday. Haha! I watch DVDs. I make DVDs of pics. I use GarageBand to record voice lessons and jamming sessions. I love to write for my blog, make little photoshop projects. I always use it during taping so I won't get bored. PML: Are there any other special people in your life who also have and love Macs, and what kind of Macs do they have? Karylle: My mom [Zsa Zsa Padilla] also has a Mac. She has a 17" PowerBook G4. Dong [Dantes] has an iMac G5, but he's always using my PowerBook. PML: Your mother is often referred to as the Divine Diva. Would you call your PowerBook the Divine Laptop? Karylle: No, but my mom's PowerBook can be the Divine Laptop. PML: If you were asked to pick a song to dedicate to your PowerBook, what would it be? Karylle: "Inseparable" by Natalie Cole. My Powerbook is always with me wherever I go. Karylle has just been nominated for Favorite Female Artist in a Video at the MTV Pilipinas Video Music Awards 2006 for her song, You Make Me Sing. Please vote for her by logging onto pinoyexchange.com/mtv or by texting "Mtvvote FFA Karylle" (send to 638 for Smart subscribers or 2219 for non-Smart subscribers). You can also visit her official website at Karylle.com. Disclaimer: The PinoyMacLovers Me & My Mac Project is an independent project and has not been authorized, sponsored, or otherwise approved by Apple Computer, Inc. The use of any of the images featured in this project, in whatever manner and for whatever purpose, is prohibited without express and written authorization from the author.